Hair oils have become a necessity in my routine lately. They provide the hydration and smoothness my hair really needs this time of year. 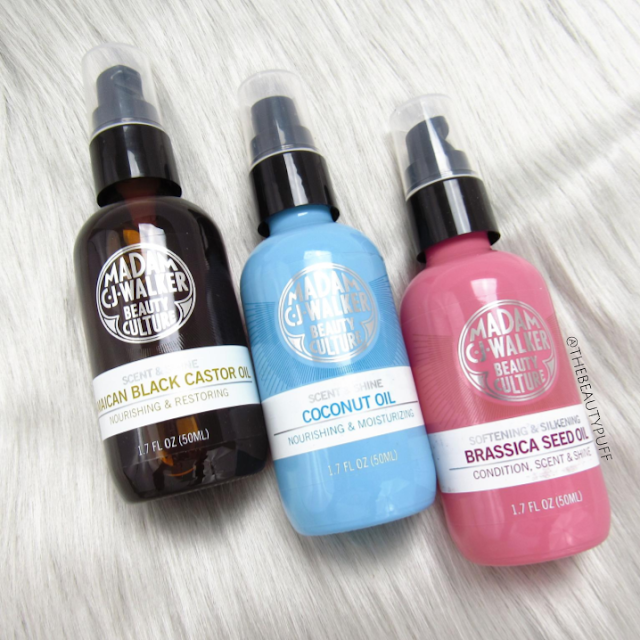 My newest oils come from Madam CJ Walker Beauty Culture. Not only are these oils rich and nourishing but they each have their own unique fragrance - amber + musk, coconut + vanilla, and sugar + velvet cream. Jamaican Black Castor Oil | Intensely hydrates, improves health, adds shine. Can also be used on eyebrows to promote hair growth. Coconut Oil | Softens, adds shine, fights frizz. Can also be used on skin and nails to add moisture. Brassica Seed Oil | Hydrates, softens, adds shine. Can also be used prior to heat styling to protect hair. My two favorites have to be the Brassica Seed and Coconut Oil. They both smooth my hair and keep it nourished so I get a silky style every time. I also use them for touch-ups when my hair is dry. They help tame fly aways and give my hair more shine in between washes. Whether you use these oils before or after styling, you don't need much because they are very rich. I only need to use two pumps for my long hair so these bottles will last a long time. If you love these oils, you can also find corresponding products within the Madam CJ Walker brand - shampoos, conditioners, styling aids and more. Shop these oils on Sephora's website below.